You go to the gas station and fill your tank whenever it gets low. That fuel is pumped up to the engine where it’s burned to produce the power and performance you expect from your vehicle. If your fuel system isn’t operating properly because of carbon build-up or for any other related reason, the result will be obvious: your engine won’t run efficiently, or it may not run at all. New Concept Auto Service is the only stop you need to make in Overland Park for reliable fuel system repairs. 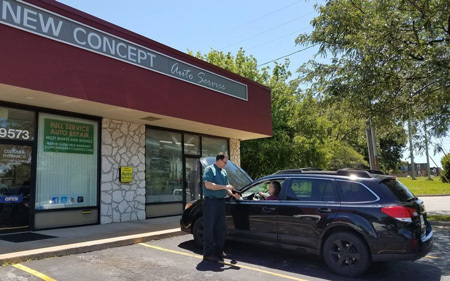 Our knowledgeable staff members are courteous and professional, performing thorough and accurate fuel system repairs on most makes and models. New Concept Auto Service is ready to tackle all of your vehicle’s fuel system repair needs. We perform only those repairs that are actually required, while we’re more than happy to explain in detail any service or repair your fuel system needs, including matters related to carbon build-up. Our technicians are ASE-certified master technicians with years of experience in the field, including expert knowledge of fuel system repairs on most makes and models. We use professional-grade diagnostic and repair equipment to ensure accurate diagnosis of every concern, whether your Chevrolet Impala needs a new fuel pump or your Dodge Journey has a leaking fuel injector. We know you don’t want to have to make a repeat trip to any repair shop because of low-quality parts that fail on you. That’s why we always use original equipment and approved aftermarket parts for fuel system repairs at New Concept Auto Service. Honest. Accurate. New Concept. Give us a call or use our online appointment form to schedule your fuel system repairs today! At New Concept Auto Service, you can rest assured that an ASE-certified technician is working on your fuel system repair. We have the expertise and training to repair any concern that pops up, from fluid leaks to worn out parts. We perform fuel system repairs on all domestic and import models, regardless of the vehicle’s age. We have the necessary diagnostic tools and the repair technology to efficiently and accurately perform your fuel system repair right the first time. It can be inconvenient trying to coordinate your fuel system repairs around your school classes or work, so we work around your schedule to make your visit as hassle-free as possible.